Hope's Cafe: UPrinting.com Postcard Giveaway!! 3 Days Only! UPrinting.com Postcard Giveaway!! 3 Days Only! Hey guys, have you heard of UPrinting.com? They are one of my favorite places to shop for any printing needs-business cards, posters, envelopes, address labels, event ticket printing, letterheads, even vinyl banners! 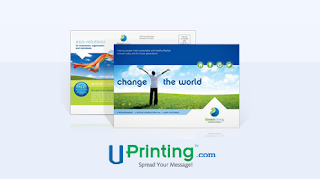 If you can print it, UPrinting has it! And I love the professional quality of these products. Don't get me wrong- I have used companies that offer lower-cost printing, but I have never been happy with the result. The business cards look cheap, or have advertising on the back; it's just not worth saving a few dollars and ending up with junk! And UPrinting is fast, too. They have a 2-business-days print turnaround time, meaning you'll not only get quality, but you'll get it fast! So, that is why I am so excited about UPrinting! I have seen the quality for myself, and I love it! And guess what? One of you will have the chance to see for yourself! The winner of this giveaway will receive 100 Postcards! The cards are 5"x7", 14pt. Cardstock Gloss, Front Only Printing!! Go to UPrinting.com and tell me a product you'd like! 1 entry-Tell me what you would use the postcards for if you won! 1 entry-Like UPrinting on Facebook and tell them you entered the giveaway at Hope's Cafe! 1 entry-Follow UPrinting on Twitter. This giveaway ends Monday, June 6, 2011, at 9:00 a.m. Please leave a valid email address in each comment, as this is how the winner will be notified. Winner will have 48 hours to respond, or another winner will be chosen. Giveaway open to US residents 18 years old and above only. This giveaway is sponsored by UPrinting, no monetary compensation was given and I will receive postcards printing for hosting. Check out UPrinting.com and their event ticket printing services for more information. Facebook is not associated with this giveaway. I like their poster boards. I follow UPrinting on Twitter - Thank you! I would use these to send to my grandchildren. They love getting mail. I'll use them for family and friends..
Like UPrinting on Facebook and told them i entered the giveaway at Hope's Cafe! I like the canvas prints! I think I would use them as invitations. I love that you can print menus there! I like their business cards. I like their selection of business cards. I like the Business Card Magnets. I'd use them to promote my friend's non-profit organization. I love that they also make window clings! The postcards are what I like and need the most! I would use the postcards for an open house I am planning to have in the fall! I Like UPrinting on Facebook and told them I entered the giveaway at Hope's Cafe! Lavera Faces Organic Skincare Review!! Gallery Direct Fine Art Framed Canvas Review!! ChicoBag Compact DayPack Review and Giveaway!! Lean Back and Relax in a New Recliner!! 10 Time-Savings Tips For Moms!! New Sofas For the Living Room! CLICK Protein Coffee Drink Review and Giveaway!! Krema Natural Peanut Butter Review and Giveaway!! Slim In 6 Update and Winner Announcement!! New Event Starting July 1!! Contigo Travel Mug-Review and Giveaway! Running Out of Room? You Need a Curio Cabinet!! Chicago Legoland Discovery Center Review!! Rock Bottom T's Review and $25.00 Giveaway!! Office Chairs Make A Great Dad's Day Gift!! Great Gift Ideas For Dad at Red Envelope!